Sometimes the most memorable rides come out of the blue. 20 years ago I was writing a road test on 400cc sports bikes and as part of the test we’d been to a track day at Oulton Park. For someone of my talent, riding a 400 at Oulton is about as close to sporting perfection as it gets. Oulton is twisty and challenging – not too quick, but with a variety of corners to really get under the skin of a small bike while riding pretty damn close to flat out (which on an unrestricted Japanese 400 is around 130mph). All the test bikes were great, but the Gull-arm CBR400RR, with its softly sprung suspension was the one that needed care in the corners and couldn’t quite match the others for confidence and lap-times. And then, we rode home. I still remember it. We took the long way, across-country on busy A roads and the twisty, deserted Bs of Cheshire, Derbyshire and Lincolnshire. I knew the CBR would shine here because it had the least extreme riding position, the most midrange power and suspension that would let me keep it pinned on the bumps. Three hours and 160 miles later (including two stops) we were home. It’s rare that you get chance to work a bike so hard and even more rare for it to feel so rewarding. I stood in the drive and just looked at it in utter admiration for about 15 minutes. How could one bike cover so much ground so fast, with such composure and still be comfortable, still be inch perfect in every corner and still leave its rider thrilled and excited while making just 60bhp? I was already a fan of 400cc sports bikes, but that ride just blew my mind. All these years on and I still want a CBR400RR. For anyone new to biking, most of the 400s weren’t officially imported into the UK, but in the Japanese home market it was their most important class. This meant that as the Japanese economy boomed in the 80s and 90s the manufacturers spent fortunes building ever-more-exotic micro-motorcycles, which became pretty-much obsolete after a couple of years and sat in warehouses, unloved. At some point in the early 90s a few enterprising independent dealers started importing them to the UK. Known as grey imports, these bikes were often almost new, with minimal mileages and in immaculate condition. They were also perfect for new riders to hone their skills on and a generation of UK nutters got their knee down first on a grey import 400. The poster bikes were Honda’s VFR400R NC30, Kawasaki’s ZXR400 (which was also officially imported into the UK) and Suzuki’s GSX-R400RR. And this. The first CBR400 looked like the original CBR600. The next one had a touch of RC30 about it, but this one, the 1990 NC29 Gull-Arm model had styling all of its own; a pepped-up, 60bhp inline four-cylinder motor with surprisingly strong midrange and one of those Honda riding positions that suit podgy six-foot-two riders as well as lightweight Japanese locals. The suspension was a little on the soft side for heavyweight European riders, but the flipside of this was that, combined with the low seat height it made getting your knee down easier on a CBR400RR than any other motorcycle – and that mattered in the mid-1990s. Between 1994 and 2000 thousands of immaculate CBRs came into the UK. Almost all were ridden hard and suffered the usual new-rider abuse, but unlike Honda’s V4s they were relatively easy to service and so most got well maintained too. Mostly, the standard exhaust can was dumped sometime back in 1996 and, being a bike owned by new riders things like fork oil, brake fluid and coolant rarely got changed. Chain and sprockets went twice as far as they should have as owners spent their cash on anodised bar ends and engine bolts. And so many have been ‘dropped at low speed’ or ’fallen off the sidestand’ (which actually means ‘crashed, but it didn’t hit anything or flip over’) that you begin to wonder if they were owned by a circus. A few years back prices had slumped to around £1500 for a tidy example, but as that generation of riders who loved them first time round are hitting their mid-life moment, prices are starting to rise. There are still some decent, unmolested bikes around and they sell for £3-5k. That’s a lot for a 25 year-old 400cc sports bike – you can buy a 1000cc Fireblade that’s fifteen years newer for similar money), but you’re reading this because you want a CBR400RR, not a Fireblade and, right now, that’s how much one costs. It is possible to find tatty projects for less than £2k, but before you spend £1800 on a project bear in mind that good parts at decent prices are scarce (especially some body panels) and that anything that has been first big bike of a dozen different newbies could be absolutely knackered. Having said that, the CBR400RR is a relatively simple machine to work on so you should be able to do much of the work yourself and, if you’re patient, there are some decent examples come on sale for £2-3k. Back in the old days if you wanted the benefits of classic bike insurance like agreed valuation, events cover and salvage retention, you’d have needed a bike that was 30 years old. Not anymore. Bennetts insurance could offer all these benefits on machines that are much newer and even on brand new bikes in some cases. Bennetts are a specialist in motorcycle insurance and have been trusted by riders for 85 years. Our panel of specialist insurers will compete hard to find the cover you need for your classic bike at the best price. 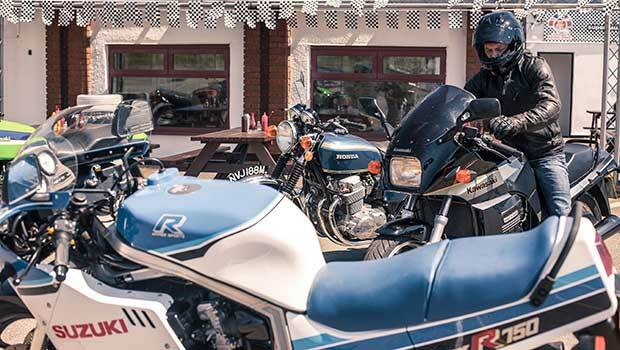 Bennetts insurance for classic bike comes with optional agreed value, no admin fees for additional bike modifications and you can combine your classic and modern bike on one multi-bike policy. Get a quote for our Defaqto 5-star rated cover today.